For happy hour we went to Brews&Cues, the pool hall part of the Beaver Street Brewpub. One of the beers on tap was the Bristlecone Brown, which my whole party decided to order. It turned out to be a very good thing. 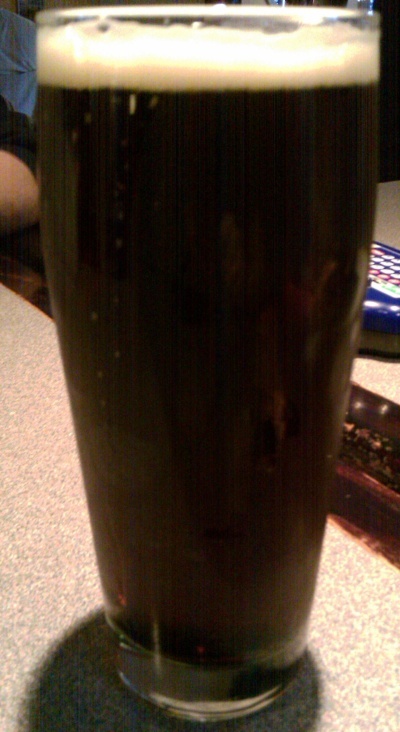 The beer itself is quite dark, with a creamy white head. It has a strong scent of pine, due to a strong hop content, but the hops are balanced by heavy chocolate malts. Easy to drink, full of flavor, not too strongly hopped. This was a great beer. I don't often find myself craving a brown ale, but this could certainly change my mind. A little on the heavier side, probably not the best choice when it is super hot, but April is still sometimes cold in Flagstaff, so that makes it perfect.